Red, white and blue, so fitting for the 4th of July! Dessert is one of my favorite food groups. I don’t know about you, but when I finish a meal, I want something sweet. I don’t care if it is a Popsicle, ice cream, fruit, or if I’m desperate a bowl of jello. But, don’t dare deny me of a sweet ending to my dinner. I just want a bite!!! That is, unless I can have the whole thing. 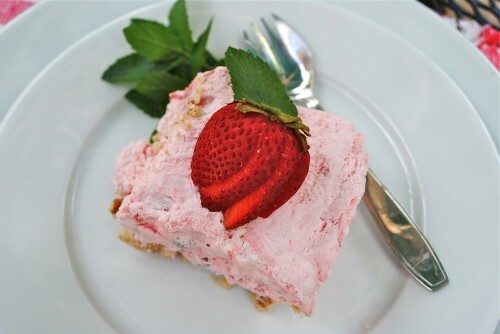 Some of the desserts I made and my mother use to make when I first got married just disappeared off the radar for about 40 years, but some have started reappearing in some magazines and TV cooking shows. Paula Deen is always making something on her show that my mother use to make back in the 50’s and 60’s. On a recent trip to Missouri, my twin sister made the Strawberry Mile High dessert that our mother use to make many years ago. I had forgotten how good it was. This is a light summery treat that will cool you on the hottest summer days. You do need a stand mixer to make this dessert. A hand mixer is the next best thing but you will have to hold that mixer for 15 minutes while the mixture beats and gets so light and fluffy. I did notice that using my Kitchen Aid mixer with the wire whisk that it beat almost to the top of the bowl in about 9 minutes. So what you want in the end is something about 4 times the volume you started with. Something old, made new again and updated a bit. The original recipe was just frozen strawberries with a nut crust and whipped filling. 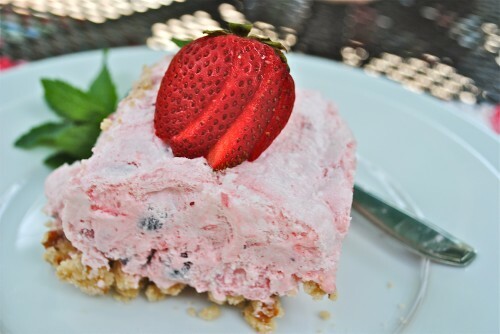 I have decided since I recently picked blueberries and got a great deal on some raspberries to add these to my dessert for a berry treat of red, white, and blue. My mother always used Cool Whip but I substituted real whipping cream in place of the whipped topping. 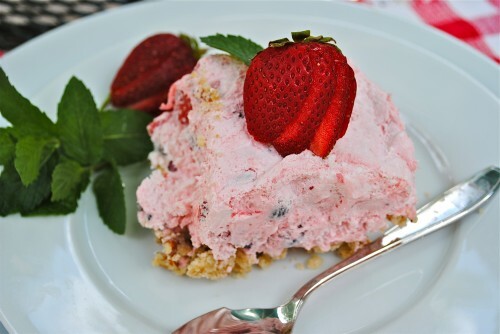 I think it gives it a much richer taste and I also decided to use some fresh strawberries along with the carton of frozen strawberries. 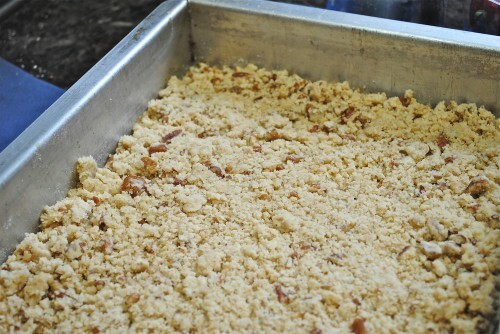 Press crumb mixture into bottom of pan and bake. 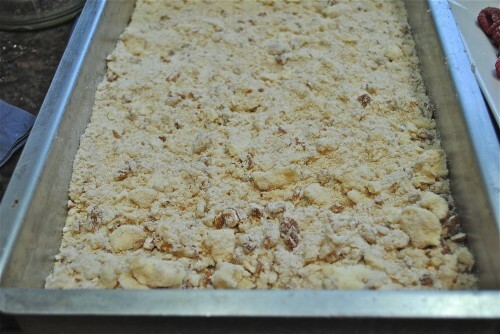 After baking, you then crumble and press back into the pan. Some fresh berries mixed with the frozen berries and sugar. Fifteen minutes of beating leaves you with a bowl full of fluff. Smooth in pan and freeze 24 hours. Mix the butter, brown sugar, flour and pecans until crumbly. 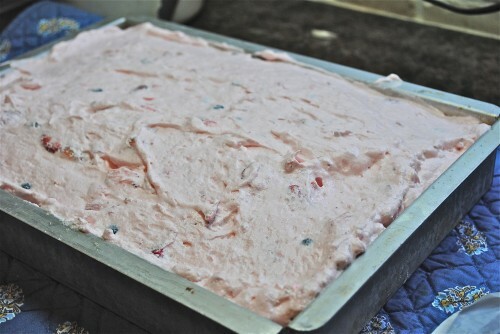 Spread this mixture in a 9 x 13″ pan. Bake for 10-12 minutes at 350°. Cool 1/2 hour then crumble and spread evenly back in the pan. 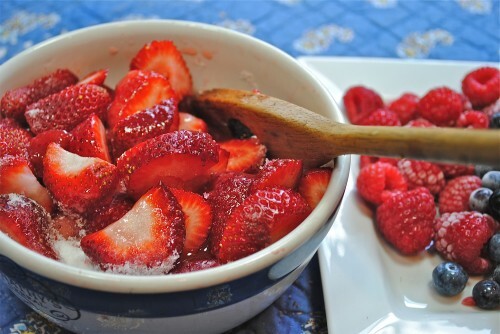 For the filling, thaw the strawberries and drain . Mix with sugar. Beat 2 egg whites until stiff. 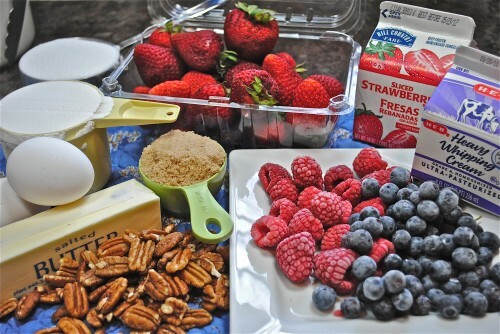 Add the sugar and berries and beat 15 minutes. 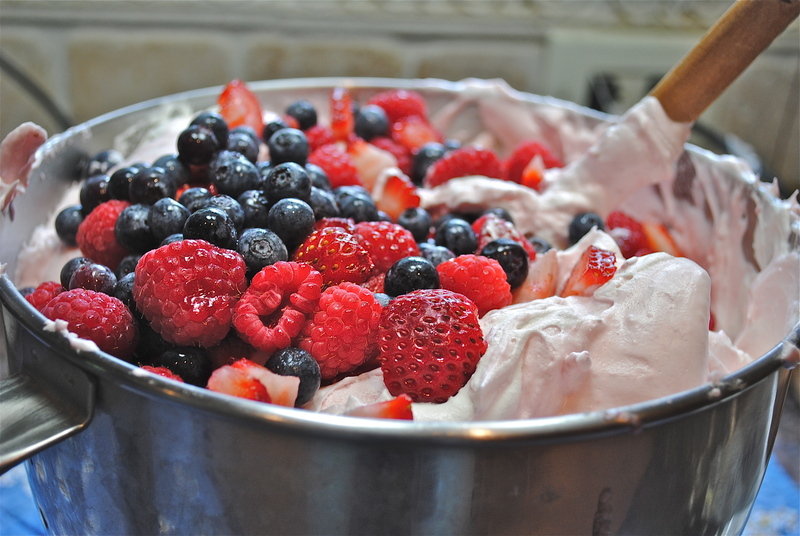 Beat the whipping cream and then add to the strawberry mixture, fold mixture until smooth and creamy. 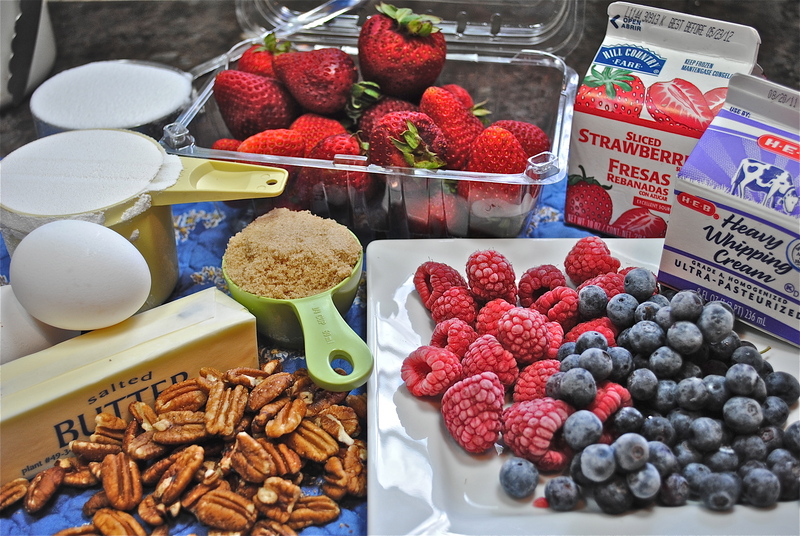 If you are adding the fresh strawberries, blackberries and blueberries, add them now*. Pour mixture over crust and freeze overnight. *Note: the original recipe did not have the fresh strawberries, raspberriess or blueberries. So, if you don’t have the fresh berries, leave that part out. It was a delicious recipe to begin with. I found when I opened my carton of strawberries that there was more juice than berries. So, if you are buying frozen, get the ones in the bag, thaw and then drain. Hi I couldn’t find another way to contact you – we shared your fruit cones on our 4th of July fruity desserts round up at the Entwined Community blog! My daughter actually requested this for the 4th, but I didn’t get around to making it. It will be on our menu soon…so yummy! Thanks for the add to your site. How did you ever find my site. Hi Sherry – google! : ) We are always on the lookout for sites by adult twins or parents of multiples. I was at Julie and Todd’s last week — actually visiting Thaxton! We had dinner with Sherry and Gary — she told me about this dessert. I can’t wait to make this! Actually, I was at Terry and Gary’s!